For farmers and others in the agricultural industry, it is very important that grain storage solutions offer protection from the weather and other factors that can spoil or otherwise make the grain unusable. That’s why there is a constant effort to identify grain storage options that are effective and reliable. Steel buildings have become a favoured option in this regard, due to a number of different factors that make them an ideal choice for grain storage, among other applications. Here are a few of these factors. One of the greatest advantages of using a steel building for grain storage is their weather-resistant nature. A common problem faced by agricultural workers is the spoiling of feed, produce, grain and other stored items due to weather conditions. Steel buildings are specially engineered to mitigate climate issues, so not only are they durable, but they also offer a level of protection that is unmatched. Whether snow, sleet, rain or shine, grain and other produce will remain adequately sheltered year-round. With weather resistant material, you receive a dry, clean interior that provides a comfortable working environment and is perfect for housing produce and feed. Steel buildings allow for thousands of customization options, but perhaps the most useful for grain storage is the ability to add proper insulation. When the weather fluctuates, interiors of buildings tend to accumulate condensation and moisture in the air and on the walls. The build-up of condensation directly affects the grain and produce being stored, causing it to spoil. But when you use an insulated steel building for grain storage, your structure is thermally efficient and climate-controlled, which eliminates moisture and condensation. Coupled with insulation, ventilation helps create a completely climate-controlled environment for grain storage. Regulating air flow and allowing for maximum aeration, the combination of insulation and ventilation stops moisture and condensation from entering the steel building, reduces air vapour, and keeps grain from spoiling regardless of the weather. It also allows for equalized, consistent temperature in the interior of your storage building, so that all of your grain remains dry and usable. This means that no matter the season, you can rest assured knowing that everything you store will remain protected. 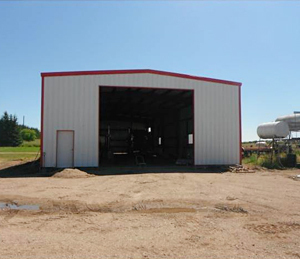 Steel buildings offer many different customization options for farmers and agricultural workers seeking an ideal solution for grain storage. To find out more about sizes, styles and other features, call Toro Steel today at 1-877-870-TORO (8676)!